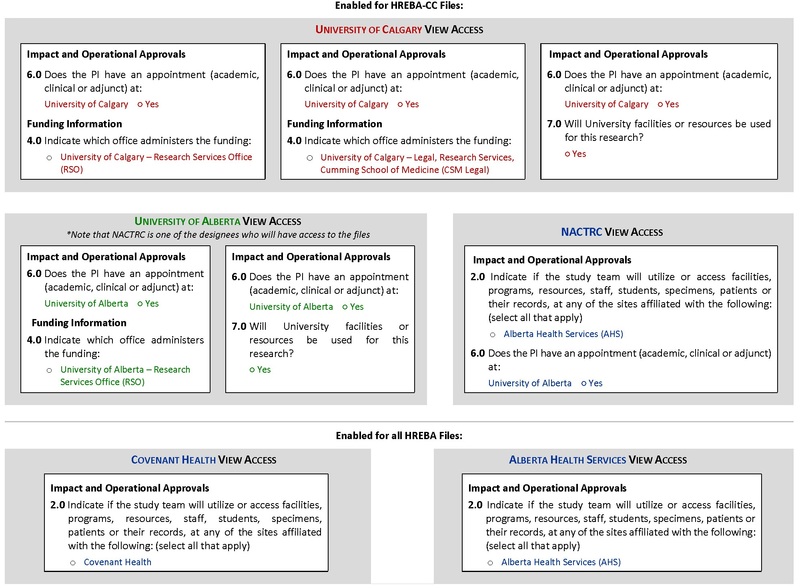 View Access is a component of the 2016 Reciprocity Agreement signed by Alberta Health Services, Alberta Innovates, College of Physicians & Surgeons of Alberta, Covenant Health, University of Alberta, and University of Calgary. It supports information exchange between parties and facilitates health research administration, in particular contracts/grants management, administrative/operational approvals and institutional oversight. It is enabled according to information provided by researchers within their HREBA IRISS applications on a study by study basis. Once enabled, designees from the applicable organization(s) will be able to view the ethics file in IRISS. Designees with view access see the application similarly to how a study team member does (i.e. application, history, attachments, approval certificates, modifications, etc. ), but are unable to make any changes to the file. Which Questions in IRISS Provide Organizations View Access? The following diagram outlines scenarios which provide view access to an application. Where there are multiple scenarios for an organization, fulfilling one will give the organization access. Note: If an organization requires view access to an existing (approved) IRISS application where the above scenarios aren’t met, submit a modification to make the necessary changes.